Daniel Bryan. Property of the WWE if anyone asks. 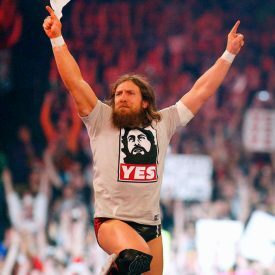 Chris & Kevin talk about the obvious thing, Daniel Bryan‘s return to wrestling. The news hit and then he is immediately involved in a violent story line. Will he take it easier on his body in the ring during his return? Could there be any more clear cut heels than Kevin Owens and Sami Zayn? Even factoring in Shane McMahon‘s earlier mishaps? Will there be a break through with the therapies for this type of head injury? Does that match now put Shinsuke Nakamura vs AJ Styles lower on the card? Has the WWE finally found a personality for Nakamura on the main show? How strange is it that both Asuka and Charlotte found themselves in grueling matches this week? Doesn’t it tarnish the look of Queen vs Empress? The Alexa Bliss vs Nia Jax match doesn’t seem to hold much wrestling value so do they have something else up their sleeve? How can the great build up for Sasha Banks & Bayley fully blowing their tops at each other not result in a match at Wrestlemania? Will something happen in the Women’s Battle Royal to make the relationship bust? Which three way match for the secondary championship look better to your hosts? Why does the WWE keep booking Roman Reigns poorly? Do you think it dawned on the writers that the angle wasn’t working out when Brock Lesnar was cheered for flipping over the gurney with Reigns strapped to it? How did the guys almost forget to talk about The Ultimate Deletion? Will the Broken Universe be back? Will Vince McMahon let it become a spin off show on the Network? We won’t but you can listen to our podcast by clicking the link below.